January 15, 2014 | David S. Maldow, Esq. A UC solution should be the ultimate communications toolbox. However, many of us find ourselves reaching outside the toolbox to perform certain communications. Is it really "unified" communications if some of our comm tools are still outside of the box? Whether it is an instant message, an email, a voice mail, a video/telepresence call, or smoke signal, it needs to be an integrated part of your UC solution. Every integration improves efficiency and productivity by reducing the number of systems and interfaces your team is forced to learn and work with. This logic applies not only to apps, but to endpoints. If you are using a UC interface at your desktop as your primary communication tool, you want the same exact interface on your phone, tablet, and even on your meeting room videoconferencing system. The VC industry has embraced this trend, touting countless Lync, and other UC, integrations over recent years. So how does Lync work at the top end of immersive experiences? I spoke with Steve McNelly, Co-Founder of DVE, to find out. The VC industry will never stop arguing over use of the word "Telepresence", but no one can deny that DVE is the real deal. One key differentiator is their "behind the screen" camera placement, which results in drastically improved eye contact compared to the standard camera placement at the side, top, or bottom of the screen. While we have covered DVE before, the focus today is how well it integrates with an Office 365 / Lync environment. The result is that MS Lync can now be considered a truly pervasive video environment, providing UC with video support from smart phones to DVE endpoints and everywhere in between. The video above is very impressive. The presentation looks like something out of the Minority Report movie. But what is most impressive is the fact that this is all running on standard Microsoft software. There is no complicated, specialized, presentation software to be mastered. These kinds of presentations are not limited to the one person who has been trained on the system. The futuristic, enhanced, PowerPoint presentation shown in the video is literally powered by the same familiar PowerPoint interface we are all comfortable with. This lends itself to a number of cool options, such as using a tablet to annotate directly on a presentation during a live session with no training required. Steve says that DVE's goal is to take the GUIs that people are used to, and empower them to do amazing things. In other words, the best part of this magic is that there is no magic. Direct integration of Window applications into existing DVE solutions result in a fantastic collaborative experience. Speaking of collaboration, it should be noted that DVE solutions are designed for to support collaboration as well as presentations. For example, the presentation in their "Immersion Room" can be controlled by meeting guest, at any location, from their device of choice, for a truly democratized BYOD experience. "We have had numerous interactions with Microsoft executives and sales people around the globe. We listened very carefully to the needs presented and then demonstrated how Lync can be transformed into real telepresence. Key is using DVE's Huddle 70 combined with Lync so life size people are seen across the meeting table with perfect eye contact. 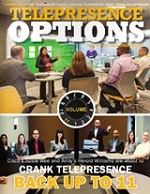 The result is an experience better then best telepresence system currently available. And the practicality of being able to do this with a single camera and single large format display is a huge advantage. THe entire room set-up is thought through from room lighting to the patented camera that aims through the LED Image. With Lync this makes for a new generation of meeting room experience. We are greatly impressed with the advancement Microsoft Lync has made in video quality over the past year. The HD image quality certainly enables it now to contend for a replacement of specialized videoconferencing enterprises and meeting room appliances. The sheer convenience to deploy what already exists in the enterprise for the desktop into the meeting room is very compelling. The issue remains how exactly will the meeting room experience meet and exceed expectations. DVE has planned for years for this shift in the conferencing industry and it is now coming to reality. DVE's technologies are vital to deliver quality meeting room experiences for any appliance or soft client." 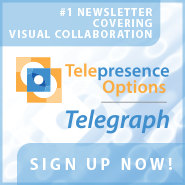 Here at TPO we have been actively reporting on the trend of visual collaboration technology being used more and more for actual collaborative work, as opposed to the old-school weekly VC status meeting. Steve says that DVE solutions are designed with a 20% Telepresence / 80% Presentation philosophy. This makes sense, as today's high end multipurpose rooms are often used more frequently for local collaborative sessions than for actual remote sessions. We no longer go to the room just do have a VC meeting and review project status. We use the room to work on our team projects, and we use the VC capability in the room to bring in anyone who couldn't make it in person. This is the new VC enabled Team Room dynamic with collaborative focus. The model works regardless of budget, one just needs to determine the experience quality requirements on a room to room basis. A small start-up with no budget may have to settle for a tablet running Google Hangouts and a whiteboard on the wall, while a midrange room may host a standard VC room system with multiple monitors and collab boards, while locations that need a no compromise immersive experience can enjoy one of DVE solutions. They key is that all of these environments can now be considered part of the Microsoft Lync pervasive video story. A UC solution should be the ultimate communications toolbox. However, many of us find ourselves reaching outside the toolbox to perform certain communications. Is it really \"unified\" communications if some of our comm tools are still outside of the box? Whether it is an instant message, an email, a voice mail, a video/telepresence call, or smoke signal, it needs to be an integrated part of your UC solution. Every integration improves efficiency and productivity by reducing the number of systems and interfaces your team is forced to learn and work with. The VC industry will never stop arguing over use of the word \"Telepresence\", but no one can deny that DVE is the real deal. One key differentiator is their \"behind the screen\" camera placement, which results in drastically improved eye contact compared to the standard camera placement at the side, top, or bottom of the screen. While we have covered DVE before, the focus today is how well it integrates with an Office 365 / Lync environment. The result is that MS Lync can now be considered a truly pervasive video environment, providing UC with video support from smart phones to DVE endpoints and everywhere in between. In other words, the best part of this magic is that there is no magic. Direct integration of Window applications into existing DVE solutions result in a fantastic collaborative experience. Speaking of collaboration, it should be noted that DVE solutions are designed for to support collaboration as well as presentations. For example, the presentation in their \"Immersion Room\" can be controlled by meeting guest, at any location, from their device of choice, for a truly democratized BYOD experience. \"We have had numerous interactions with Microsoft executives and sales people around the globe. We listened very carefully to the needs presented and then demonstrated how Lync can be transformed into real telepresence. Key is using DVE's Huddle 70 combined with Lync so life size people are seen across the meeting table with perfect eye contact. The result is an experience better then best telepresence system currently available. And the practicality of being able to do this with a single camera and single large format display is a huge advantage. THe entire room set-up is thought through from room lighting to the patented camera that aims through the LED Image. With Lync this makes for a new generation of meeting room experience. We are greatly impressed with the advancement Microsoft Lync has made in video quality over the past year. The HD image quality certainly enables it now to contend for a replacement of specialized videoconferencing enterprises and meeting room appliances. The sheer convenience to deploy what already exists in the enterprise for the desktop into the meeting room is very compelling. The issue remains how exactly will the meeting room experience meet and exceed expectations. DVE has planned for years for this shift in the conferencing industry and it is now coming to reality. 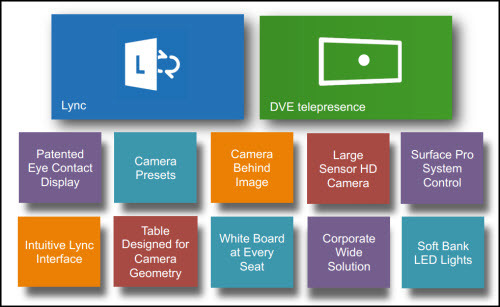 DVE's technologies are vital to deliver quality meeting room experiences for any appliance or soft client.\"